"I am not made up of particles and waves and beams of light with a definite existence. Instead, I work in a much more exploratory way. I am aware of all the possibilities at once and I try them out all the time. I fail all the time, I succeed all the time. I refine all the versions of Me, and reinvent Me forever. I create, and I destroy all the same, to create again. Because I can. I am everywhere. I am everything. If this version of Me I call humans isn’t protecting all the other versions of Me, I can always create something new." 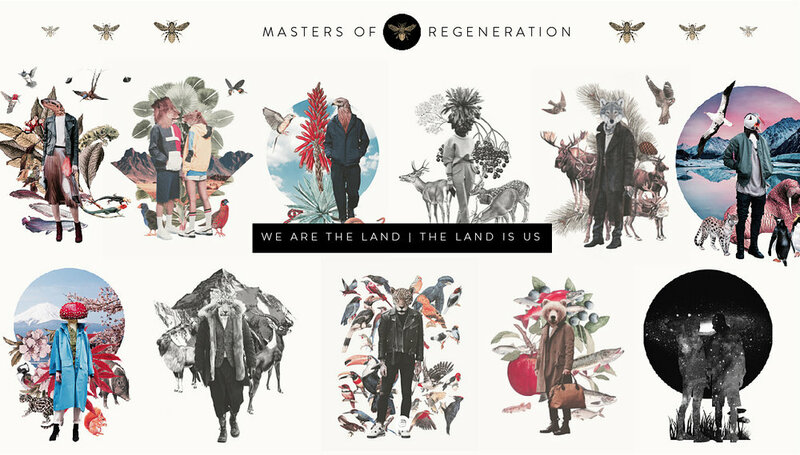 Masters of Regeneration (M.O.R) is a response to the challenges we all face as a species right now, and the solutions to protecting the conditions that allow us to be alive today, on the planet. M.O.R is an omni-channel lifestyle brand with an informative podcast, an ecological clothing and accessory line, a series of online courses and deep ecology meditations, and an informative documentary series in pre-production. Our launch collection is called PROTECTORS OF LIFE, and the characters are inspired by the supporting role apex predators and keystone species play in their ecosystems. "Having put ourselves in charge of our own evolution and that of other species, what will we choose to do with this extraordinary power?" “We need a series such as MASTERS OF REGENERATION that tells the dramatic journey of humans AND the planet in this epic adventure filled with hope, the present reconnection to living systems and the natural cycles of regeneration through science, nature and the unique power of the human imagination. We partner with the brightest minds in living systems, natural cycles, biological information flows, banking, and evolutionary theory reconnecting humanity and nature through ancient traditions, groundbreaking science, tech and data to educate the public at large on how beneficial, productive, and profitable it can be to partner with Life's staggering capacity for overflowing self-organization and regeneration. We tell each episode by visiting one of these masters, someone re-imagining our relationship to the environment, and our models of reality. We use the hero journey structure to make them relatable, and then present their heroic, non-conformist approach to the world we live in and discuss mind-expanding ideas and possibilities with them. We are creating global alliances to support other heroes of our time. We are looking for a select group of visionary individuals and organizations whose mission and brand identity align with that goal, to join this outstanding team in long-term investment, sponsorship and co-creation. 2) they are aspects of nature, natural cycles, or forces of nature at play. That is, seagrasses, the carbon cycle, plankton, soil, coral reefs, DNA, gut bacteria, water, tectonic plates, and so on. 3) they are DYNAMIC processes: dramatic changes of mindset and the story of an epic shift for humanity happening right now on Earth. NEW SYSTEMS OF LIVING. bye bye old world systems, hello regenerative revolution. In each episode, we follow a classic hero journey arc, focusing on the moment the human character saw an all time low in their life, an epic challenge that took them out of their ordinary world, and propelled them onto a brave journey beyond themselves. All of them daring to re-envision what it means to be Homo Sapiens today. There is a whole new world being born right in front of our eyes. A new relationship of humans to our environment and the cycles of nature is brewing on a massive scale. Outdated systems are becoming obsolete, new systems are being born. As we move from understanding life through the lens of specialized activities and parts of the whole, to a broader understanding of life as interdependent cycles of regeneration and the flow of living systems, the big picture starts revealing itself before our eyes. We stand in awe and wonder, as if we could witness evolution happening in real time. As if we were watching a timelapse of plants being born, reaching for the sun, and dying away back to the soil, realizing the cyclical and interdependent nature of life on Earth. Earth, our fertile, abundant home, has been refining itself, while overflowing with countless lifeforms since the beginning of time, constantly adapting to ever-changing environments. In MASTERS OF REGENERATION Tomas and team take you on a journey to delve into (living) systems, the regenerative revolution in medicine, science, and food production, ancient traditions, and the integrative ways humans face the challenges arising from an ever-faster changing environment. To create new regenerative practices that support both the land, holistic human health and abundance all around, a new mindset is being born. -—— (This series is designed to lead the space "humanity, health, regenerative practices, and the planet". Think Anthony Bourdain meets David Attenborough, geologist Iain Stewart, Chef's Table and Shots of Awe's Jason Silva, infused with the exponential possibility spirit of Peter Diamandis and evolutionary thinkers like Robert Lanza, Juan Enriquez, and George Rush among others). AFTER ALL THE QUESTIONS WE ASK OURSELVES, ONE LAST PRESSING QUESTION REMAINS: SINCE NATURE WILL RESTORE THE BALANCE OF THE PLANET ONE WAY OR ANOTHER, HOW DO WE MAKE SURE WE HUMANS STAY WELCOME TO THE BANQUET? HOW ARE WE RE-IMAGINING AND REBUILDING OUR MODELS OF REALITY? Series like Planet Earth or Blue Planet are spectacular, remind us of the majestic wildlife on Earth and tell us the dramatic story of the survival, reproduction, social life and challenges animals endure. Whenever we watch a series about humans it is either about the catastrophic effects humans have on the planet, or traditional cultures celebrating ancestral rites (see BARAKA, SAMSARA, and so on).